Here’s a close up showing the quilting on this one, which is technically the best quilting I feel I’ve done, just meandering lines in a grid, using Valdani Withered Blue on top and their Brick (I think it is) in the bobbin. And to the right, the whole quilt. What was fun with this was that I didn’t buy any fabric, just found stuff in my existing stash that played together nicely. Following Joan Ford’s advice in Cut the Scraps! was a big help as all the squares were cut to five inches. 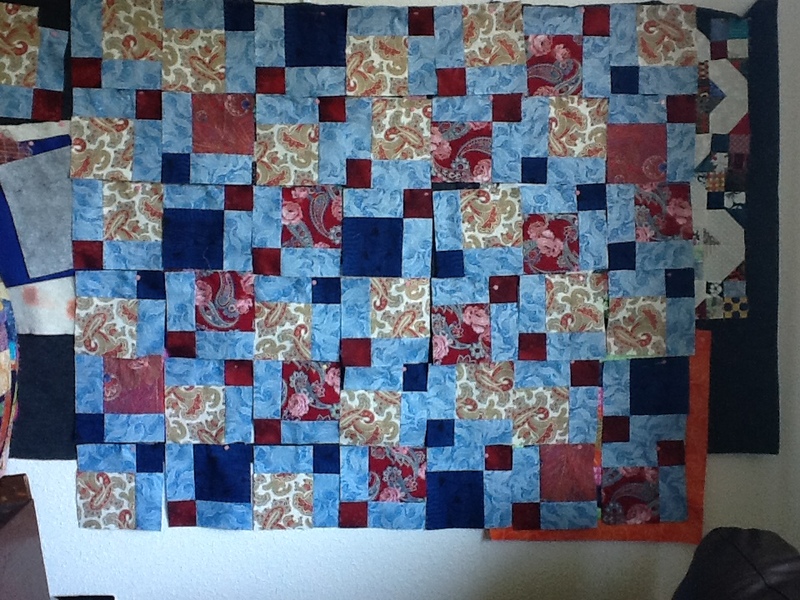 The paisley and the pale blue feathers were yardage which I cut, the others were from scraps I’d already cut down. It was fast and fun to pore through the clamshell I keep them in and pull out the dark blue, red, peacock feathers and the deep red paisley and then just sit and sew. was a terrific quick primer that saved me from making any design mistakes. 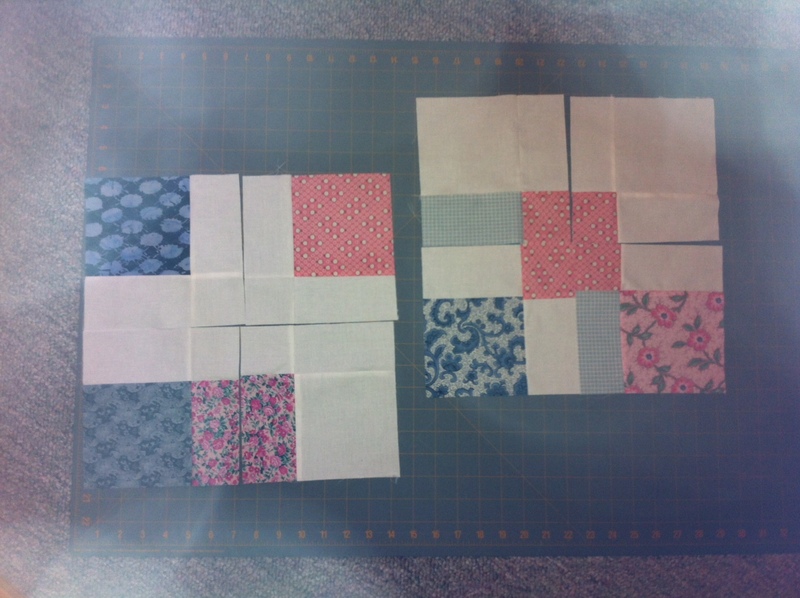 You put the focus fabrics in the four corners of the nine-patch, the middle fabric will be sliced into four little squares, and the fabrics in the middle of each outside appear like sashing, which is why I stuck to the blue feathers so there would be some consistency to the design. When the quilt was started, no one knew whether the baby would be a boy or a girl. Here in British Columbia you can only find out by paying extra for a special test. Anyway the not knowing meant I needed to choose colours that were not gender specific, which I think I achieved. In the end it was a boy, but this would also be suitable for a girl too. Disappearing 9-Patch, work in progress! 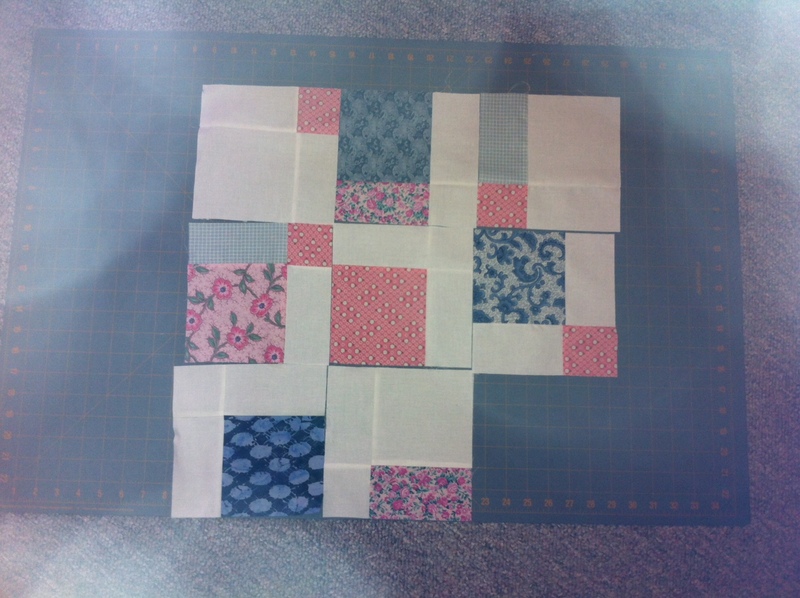 This is a process shot of a disappearing nine patch quilt while it was on my design wall. Other bits and pieces are peeking out from the sides, this was just right on top of everything. It’s now assembled and in the process of being quilted. The Missouri Quilter YouTube video I watched was great as it clearly explained what to expect and how to decide what fabric goes where. That was how I picked the light blue feathery print for the four pieces in the middle of each outside, so they would become sashing. I put my focus fabrics in the four corners and the centre fabric was consistently either dark blue or the rust fossil fern print. There’s many ways to put disappearing nine patch together but for this first attempt I decided to follow the advice given and ensure that I wasn’t trying to match a whole lot of inside seams. 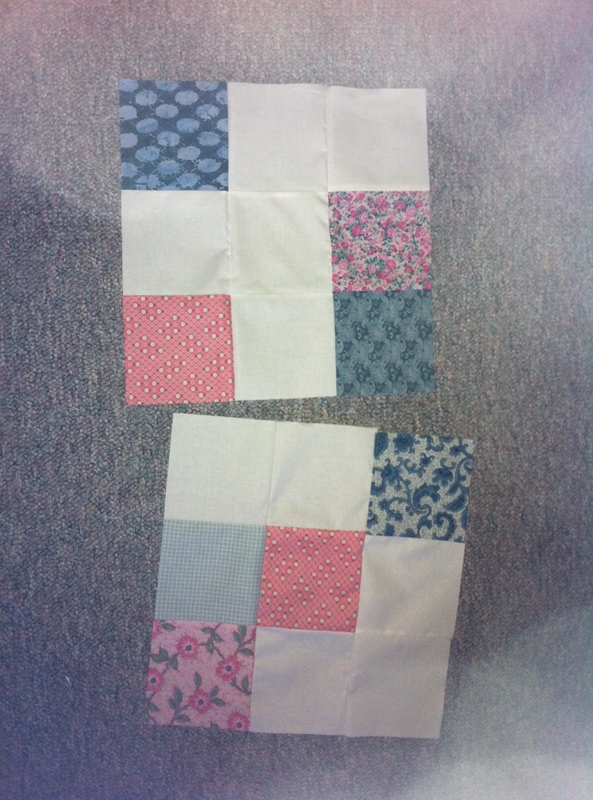 Just matching the seams on the blocks was quite enough of a challenge, thank you. The design wall was a blessing as the blocks stayed up for over a week while I rearranged them to not have any matched focus fabrics touching each other. Doing that probably took longer than it took to do the actual sewing of the top. You can tell this was still in design because there a several places where focus fabs were touching. Point of Pride: Everything came from my stash, no shopping was involved!